Ukrainian warplanes used 500kg aviation bombs in their attack on the town of Gorlovka on Sunday, said Aleksandr Zakharchenko, head of the People’s Republic of Donetsk, adding that it was not a targeted bombardment. "Towards the evening, the Ukrainian bombers performed an airstrike on Gorlovka with 500-kilogram aviation bombs. Notably, the bombardment was not targeted; it came from over the clouds and the aim was simply to hit the town,” Zakharchenko said. Over 30 people, including children, have been killed or injured in Donetsk as a result of the Ukrainian offensive on Sunday, he added. The city's mayor, Oleg Gubanov, also said that two people were killed and 16 others injured after a Ukrainian shell exploded at a bus station in Gorlovka. Several buildings, including four schools and a kindergarten, suffered direct hits during the bombardment, “which went on without a break for almost 24 hours,” he added. 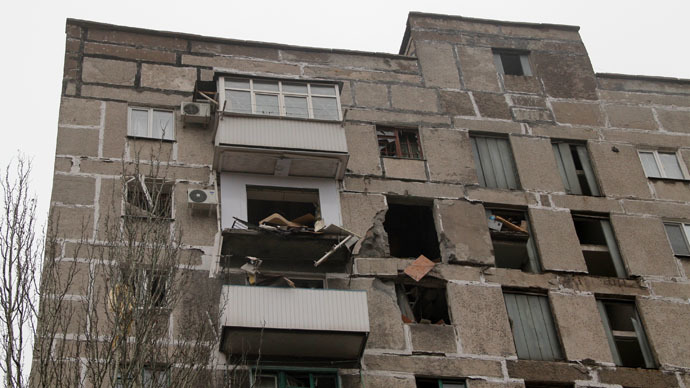 According to Donetsk administration, at least five civilians were killed in the city on Sunday. Several residential buildings and a shop were seriously damaged by artillery fire. “For several weeks, we’ve been shouting and trying to prove that the Ukrainian military is using the truce to perform a massive regrouping of its forces to prepare for a large-scale offensive. But all of our appeals to the OSCE and Joint Centre for Control & Coordination (JCCC) have been ignored,” the head of the Donetsk People’s Republic said. “The representatives of the JCCC have themselves felt the scale of the Ukrainian shelling,” as they went under fire in Gorlovka earlier in the day, he added. “The self-defense forces have successfully repelled all six attacks by Ukrainian armored vehicle columns, performed with massive artillery support. As a result, I can say that the Ukrainian offensive on the airport has failed,” he said. Rebels dislodged Kiev troops from the village of Peski, which was used by the Ukrainian army to shell the Donetsk airport on a daily basis, he added. The Russian representative at the JCCC has confirmed that his colleagues came under artillery fire from Kiev forces in Gorlovka on Sunday. He also stressed that the shelling of residential areas in Donetsk is being performed by the Ukrainian military’s regular forces. "Previously, all the attacks on Donetsk and its suburbs were mainly conducted by uncontrolled units of the National Guard or the so-called territorial battalions, but today it’s clear that the shelling of residential areas is performed by regular units of the Ukrainian army. Also, for the first time after a long break, the Ukrainian side is using aviation,” the representative said. The resumed offensive by the Ukrainian military in the Donetsk Region is a violation of the Minsk peace deal, signed by the two sides on September 5, he added. Instead of the agreed withdrawal of troops to a safe distance, “we see, in fact, an attempt by the Ukrainian forces to storm the rebel positions, which led to new mass casualties among civilians in Donetsk and Gorlovka,” the representative stressed.